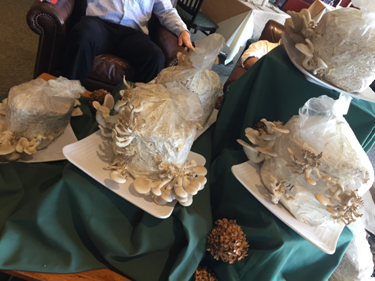 What’s happening at the St. Regis: Mushrooms! Several weeks ago we were able to harvest our first batch of student grown and student harvested Oyster Mushrooms. Mushroom patches were purchased with a Paul Smith’s College Campus Sustainability Fund Grant from Fungi Perfecti.com. Everyday, twice a day, the mushrooms were sprayed with water, this helps the mushrooms grow by keeping him moist. The mushrooms are covered with a plastic bag that has holes poked into it. The mushroom patch breathes through these holes; mushrooms will also grow through these holes. During the first 7-10 days is when we first started to see the primordia, which is the earliest stage of mushroom formation. It wasn’t until 3 or 4 days later that the primordia started to mature and reach full maturity. Once the mushrooms reached this stage we moved 4 or 5 patches “bags” into the dining room, using them as a center piece for the room. Our mission as a farm to table restaurant is to educate our customers and provide them with a visual as to where and how their food is being grown. Throughout the week we offered a special oyster mushroom dish, which seemed to be enjoyed by everyone who ordered it. 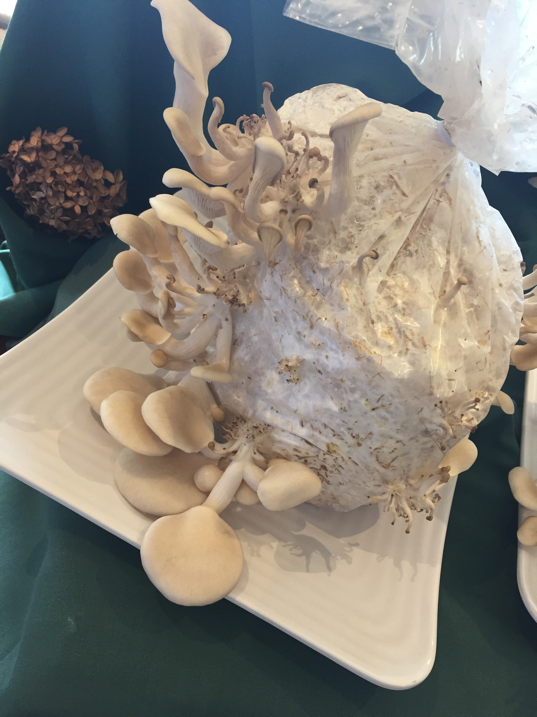 On Friday we did a special presentation of the mushrooms in our dining hall. Kids seemed to be the most “wowed” by the mushrooms. We had finished our mushroom supply that week. The cool thing about the mushroom patch is that it will regrow, even after the first harvest. As long as they are misted and maintained, we should be able to keep harvesting once the mushrooms mature again. The experience of growing mushrooms that we actually use in the kitchen has opened my mind to new ideas and uses of locally grown products. Climb it 4 Climate is an unsupported thru-hike of the 46 High Peaks designed to raise funds for programming at Paul Smith’s College’s Osgood Farm, a site devoted to mindful living practices that promote change on a community level. PSC instructor Bethany Garretson aims to complete the hike in just 8-10 days. This isn’t about climate change awareness. It’s about climate change action. By inspiring people to live in more active, locally-oriented and hands-on ways, we can make a tangible difference. You could donate an amount ranging from $25-$1,000 OR you can hike a high peak yourself! Just send a photo from the summit, along with the hashtag #Climbit4Climate. A donor will give $10 to the fund every time someone sends in a tagged photo, up to 200 peaks climbed. What is it like to work for a rapidly growing renewable energy company like Apex Clean Energy? Let me give you the inside scoop. This summer I worked as a development intern for the Galloo Island Wind project in Hounsfield, New York. Over the past few months, I had the opportunity to educate the public about the project on many occasions. The thing that you might not see from the outside is that people are not always warm and fuzzy when it comes to putting windmills in their backyard. I got to hear occasionally about how bad some locals feel that these windmills are going to be, but I also got to speak with a lot of people who feel just as passionate about renewable energy as I do. My favorite part of this job, however, is speaking with people who are open minded and really listen to what I have to say without preconceived biases. These are usually the individuals who soak up all the information and come to their own conclusion that wind energy is a clean and sustainable resource. Wind and solar energy are the way of the future, and having the opportunity to help in the early stages of their production and help my community at the same time is life changing. I have learned so much while interning this summer and I am sad that my days with Apex Clean Energy are coming to an end. I will never forget this experience or the people that have been key factors in helping me throughout this summer to grow.